Paul Volpe saved many factions of the poker world from a major financial headache earlier today after he defeated Daniel Negreanu heads-up in Event #13. 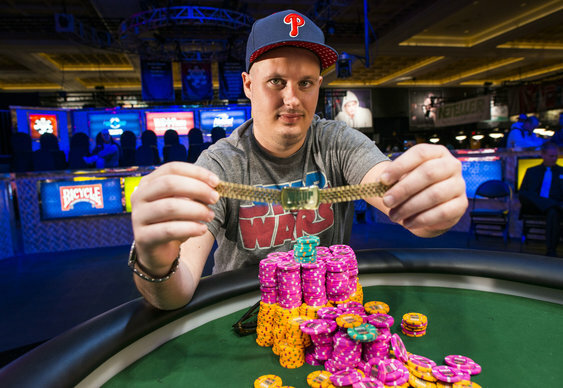 Not only was the victory special because it was Volpe's first WSOP title but it meant all the people who'd bet against Daniel Negreanu and Phil Ivey winning a bracelet in 2014 were spared a loss. Indeed, before the Series began Negreanu sent out a tweet which pitted his and Ivey's skills against the world. Offering even money bets up to $1 million that either he or his partner would win a title, the message soon attracted a slew of responses. While some thought it was good bet, others were convinced Negreanu had lost his mind. However, the naysayers will probably now be sweating the next $10,000 event as Negreanu's near miss in the 2-7 Draw Lowball Championship certainly proved he's on form this year. Of course, while it's easy to lament on what could have been for Negreanu, it was Volpe who stole the show after beating the likes of John Monnette, Brian Rast, Jason Mercier and Negreanu to pick up the $252,524 top prize. The final hand of the tournament saw the young American draw a J-T high and hold as Negreanu's J-6-5-4 draw a Q on the final round to leave him with the worst hand and no chips.